Missed the Haunted Hoops entry? click here for loads of information and links. Last week, I did a refresh on Tempo-Free Stats, where we looked at the concept of a possession. We then covered the role a possession plays for Offensive Efficiency, Defensive Efficiency, and Efficiency Margin. However, there's a lot more than can be done for tempo-free stats than just points-per-possession. Each team's offensive efficiency (AdjO) and defensive efficiency (AdjD) can be better understood with the Four Factors. Again, my apologies if this is too simple, and you've been warned if you have no interest in stats. I'm going to eventually build on these concepts to do some more interesting posts, and these will be used as reference. What are the "Four Factors"? The Four Factors come from Dean Oliver, whose "Basketball on Paper" book is the reference manual for most of these concepts. He ran through a lot of complicated math to derive these factors, and they're generally accepted within the basketball statistics community. Just like the first post suggested that the stats may seem tricky but really aren't, the same concept applies to the four factors. Basically, all that these ideas try to accomplish is to look at shooting, rebounding, turnovers, and free throws. There's nothing arcane or fancy about that, and the tempo-free approach just builds a better mousetrap. #1 - Shooting - or effective Field Goal percentage (eFG%) - It's intuitive that it is important to make a high percentage of your shots. However, if you make a lower percentage of three-point shots, it might not matter. eFG% accounts for the extra point a team gets from the three-point shot. This is the same eFG% as a team that shoots 4/12 from three 4 + (0.5 * 4) / 12 = 50%. In 07-08, the #1 team in the nation was Utah State (57.4%), and Marquette ranked #141 (50.6%). Generally, eFG% is by far the most important of the Four Factors. #2 - Rebounding - or Offensive Rebounding percentage (OR%) - This factor breaks down rebounds and focuses on offensive rebounds. Specifically, OR% takes a tempo-free look at the percentage of total offensive rebounds. What's that mean? As I'm sure the coaching staff drills into the players' heads, every defensive rebound by the opponent is a potential offensive rebound by Marquette. How many offensive rebounds were available, and how many did your team get? You'd like your OR% to be as high as possible. As an example, going back to the UW @ Madison game last year, Marquette had 21 offensive rebounds and Wisconsin had 18 defensive rebounds. MU's OR% was 21 / (21 + 18), or 53.8%. The #1 team at OR% last year was North Carolina (42.4%), and Marquette was ranked #23 (37.8%). Despite our interior issues, the team was a strong offensive rebounding team. Does anyone else find that kind of surprising? #3 - Turnovers - or Turnover Rate (TO%) - This is another "tempo-free" stat that looks at the number of turnovers per possession. Ten turnovers in a game makes a big difference if you play the game at a pace of 75 possessions versus 62 possessions. Unlike eFG% and OR%, for this factor it's better to have a lower percentage. The standard view is that a turnover rate of 20% is considered average. Anything below 20% is better than expected, and anything above 20% for your opponents is better than expected. In 2008, Marquette was the #37 team in the nation at protecting the ball (18.4%) and the #49 team in the nation at forcing turnovers (23.4%). As your eyes told you, Marquette often won the turnover battle. #4 - Free Throws - or Free Throw Rate (FTR) - There is some confusion out there on the best way to calculate this statistic. Sometimes it's seen that one should look at one formula for your team and another formula for your opponent, but for simplicity, I like to use a standardized view for each team. As an example, if you look at the UConn Box Score from last year, you can calculate the Free Throw Rate for each team. That's, um, bad for Marquette. Of course, it wasn't all that surprising, because we were the #262 team in the nation at FTR Defense (at 41%). Why should I care about the Four Factors? Two reasons. First, the four factors allow one to look into the strengths and weaknesses of a team. Going back to the 2008 Scouting Report, we can see that Marquette was strong offensively at protecting the ball (18.4% TO%) and offensive rebounding (37.8%), but only mediocre at eFG% and getting to the line for FTR. Defensively, Marquette was strong at limiting their opponents from eFG% (46.3%) and forcing turnovers (23.4%), but they were weak at limiting offensive rebounds (33.4%) and from preventing their opponent getting to the line (41.0%). Second, we can look at the Four Factors to understand what plays the greatest role into offensive and defensive efficiency. Let's look back at the efficiency numbers for the last two years. As a reminder, the defense in 06-07 was better (lower) than league average, but the offense was worse (lower) as well. Last year, the offense was better (higher) than league average, but the defense was also worse (higher). As a reminder, I'm using the numbers against top 100 opponents only, which is why those won't look the same as the Pomeroy numbers. Which of the four factors provided the greatest boost to our offensive efficiency last year? 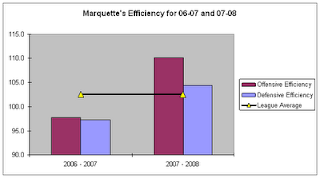 Marquette got better in three of the four factors. Most significantly, the team's effective field goal percentage and turnover rate both went from below league average to better than league average. OR%, which was already a strength in 2007, got even better in 2008. Only our already poor FTR got worse. The next step would be to look into which aspects of our eFG% and TO% got better (hint - Jerel improved his offense a ton). After looking at that, we can see which of the four factors made our defense get worse last year. The clear culprit is that while we were improving our eFG%, our opponents were also improving as well. More than anything, that factor transitioning from better than league average to worse than league average, shows why our defense was worse last year. Although our opponent's FTR was also worse, it was poor the previous year as well, so that wouldn't account for the change. Note that the TO% by our opponents got better for Marquette as well, so even though we were forcing more turnovers, our defense got worse (cough). The real value of tempo-free stats is that they allow some additional insight into how well a team is performing in comparison to their peers. Although they have weird names like Offensive Efficiency and effective Field Goal Percentage, it's really just a more insightful way of looking at possessions, shooting, rebounding, turnovers, and free throws. We can see objective measures of the team's strengths and weaknesses, and how those areas factor into offense and defense. Understanding how these concepts work will allow us to see which players provide the greatest impact and how well two teams can match up. While these four factors appear important for analyzing the team, I am interested as to why you see them as the most valuable indicators. What makes them more critical than tempo stats like shots or assists? I agree that tempo-free stats can make comparisons easier, but couldn't they also mask potential strengths related to tempo? The ability (or inability) to dictate tempo may be an important factor for some teams. Not sure which is more impressive: Al McGuire's quote or Dean Oliver's insightful breakdown of strengths and weaknesses of a team. His book - Basketball on Paper - is a must read for any statistician or hoops fanatic. Oliver - thanks for the question. The way that I understand Dean Oliver's analysis is that he took ~6 years worth of data and figured out which statistics meant the highest win percentage across the board. He then fixed some variables (like eFG%), and iterated multiple times. He may have done some sort of multivariate regression analysis to determine as well, but I'm not sure. For Peter Robert Casey, thanks for reading. I agree that "Basketball on Paper" is a must-read, even if you don't particularly care about stats. My copy is now well worn, fully marked, and dog-eared. Thanks for reading!